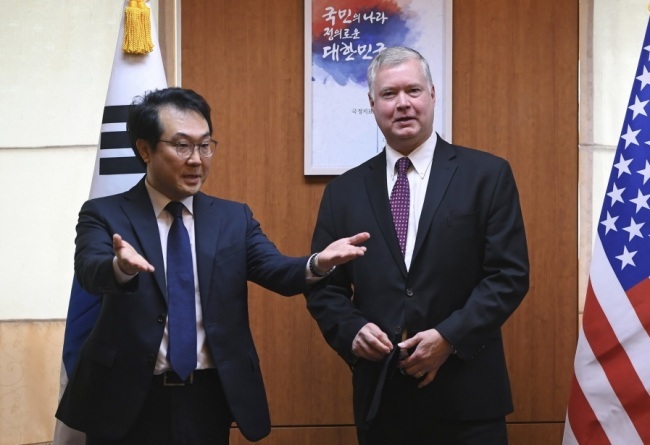 The US special representative on North Korea policy, Stephen Biegun, will visit Seoul this week to find ways to salvage dormant denuclearization negotiations with North Korea, officials said Sunday. Biegun will arrive in Seoul late this week to meet his South Korean counterpart, Special Representative Lee Do-hoon, for a second face-to-face meeting of the joint working group on North Korea. Seoul and Washington launched the working group in an inaugural meeting on Nov. 20 for "regular, systemic and formal" communication on North Korea policy as the allies increased efforts to coordinate their policies on their shared policy goal of denuclearizing North Korea. The working group also held a videoconference meeting earlier this month. The upcoming meeting will address both the ongoing standstill in denuclearization negotiations between Washington and Pyongyang and ways to get them started again, according to officials here. No meaningful negotiations have taken place between the US and North Korea since US Secretary of State Mike Pompeo's visit to Pyongyang on Oct. 7. Pompeo and his North Korean counterpart, Kim Yong-chol, were scheduled to hold talks on Nov. 8 in New York, but the meeting was postponed indefinitely as the two sides were wide apart over Pyongyang's demand for sanctions relief and Washington's demand for more denuclearization measures. In this week's talks, South Korean and US officials are expected to share views on why North Korean leader Kim Jong-un's pledge to visit South Korea has fallen through and what effects it will have on the denuclearization process.